Everyone in America likes to say we have the best healthcare in the world. But can you contact the director of a top cancer institute and get scheduled for an appointment with the director himself in less than a week ( if at all)? When you arrive at the medical facility and fill out your paperwork will you be paying the equvalent of $18 USD to see that doctor and his colleagues? Will your doctor sit there and read your medical records and then answer all of your questions with compassion and without hurrying you out of the office? Will they call a colleague in another city right then and there and get you a top specialist referral immediatelly before you leave? 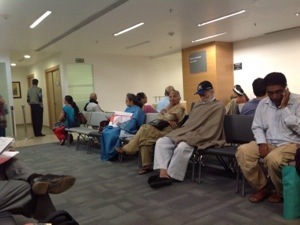 That’s what happened to us at the Medanta MedicityCancer Institute in Delhi. Despite the facility being enormous with huge amounts of people everywhere, Dr. Ashok Vaid treated Scott like a person instead of a number. He felt heard. The Indian doctr team we saw understood that Scott’s goal is to remain alert while managing his pain with drugs. They were surprised he was taking methadone because it’s not an approved drug in India. This means we would not have been able to refill Scott’s prescription here anyway. It ‘s been two weeks since he’s been on methadone and the side effects are intolerable….nausea, dizziness, hallucinations, and prolific night sweats…plus it hasn’t kept the pain under control. Dr. Vaid and Dr. Gupta suggested morphine patches that release painkiller 72 hours. However methadone is a heavy duty narcotic that requires a step down process and causes withdrawal symptoms that may complicate our travels. So, the plan is to get off methadone and onto morphine patches when we get to Goa where we will be settled in for awhile.